Tomorrow might possibly mark our first ski session in Scotland! It's been snowing pretty regularly all week, including a couple times today. We've been checking the snow and weather reports at the nearby ski centres and plan to make the 1.5 hour drive to Glenshee tomorrow to see if we can try it out. We have to rent our gear so it all depends on if they have enough to spare and if the road conditions hold up enough for us to get there. It's a little less icy in places now, though the weather's been extremely cold and ice forming overnight is always a danger. The fresh snow covers any ice that forms, making it hard to spot at times. Yesterday we went to The Ashvale for dinner with Terri and Steve--they are both back in town from their Christmas trips back to Texas. We were a bit jealous hearing about all the great things they enjoyed while home, but we can't wait for our turn soon! 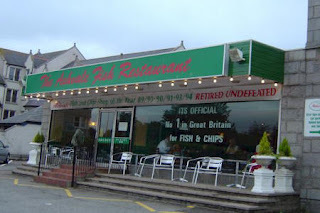 The Ashvale touts a highbrow claim of having the best fish and chips in Britain. While I'm not sure if that's true, they did win our vote for best fish and chips so far in Aberdeen. The batter was really light and crispy, so many times fish and chips are just soaked in grease and then doused in vinegar. We tried out a chipper in Dublin that served them with the fish skin still on, yuck! Plus most shops are really small and have no tables or chairs, there's usually barely enough room to walk in and order. So it was novel to have a place to sit while we ate. After dinner, Steve, Mike and I went out for a few Friday night drinks and ended up at a local Japanese restaurant off Belmont Street (I can never remember the name...). We ordered saki bombs from there once and the bartender totally remembered us and pulled out the bottle of saki and chopsticks! If you've never had a saki bomb before, they are really fun. You take a glass of beer, place two chopsticks across the top and balance a glass of saki on top. Then you do a chant of your choosing and pound the bar at the end, causing the saki to fall into the beer then you chug the whole thing! Saki isn't too strong, it's basically the same amount of alcohol as wine, seeing as its rice wine. And just like last time, curious onlookers enjoyed watching us set up our unusual shots and laughed when we did our chant and slammed the saki into our drinks. I'm sure that won't be the last time we visit!